I am interested in questions on how value is created and how authenticity relates to reproduction. In this text I will make remarks on the relation between surface versus content, how status symbols breed consumerism, and how things become representations for us. A relationship between viewer and object. An energy that arises. What you become enlightened of varies depending on the surrounding conditions. How much you want to give of yourself is also dependent on specific conditions. You see an object. Light bounces on all visible surfaces and flows, through your eyes, into the brain. What you see is mixed with other things you have seen or experienced earlier in life. The light bouncing off the object and into your brain is mixed up with everything else in there. Everything from fundamental values ​​and the instinct you have as a human being, to what favorite color you have and what you have eaten for breakfast. Even values ​​that are not your own and other people's opinions mixes together in the light. These values ​​are difficult to crystallize. When will they become your own, and when were they someone else's. Without a doubt we are influenced by our surroundings and it is the phenomenon that makes us value things that are the fuel in this text. The process by which an object go through before it get raised and considered as valuable, will be dealt with here. Do we create our own interests. How dependent is the external world of our internal. How is a trend born. When do our thoughts become our own, and will they ever. Is quality being devoured by the hunt of visual beauty. During my creation of a sculpture, that depicted the legendary bicycle Cinelli Laser, I devoted a lot of time thinking. I reflected on the value of this legend and also how other things got its value. 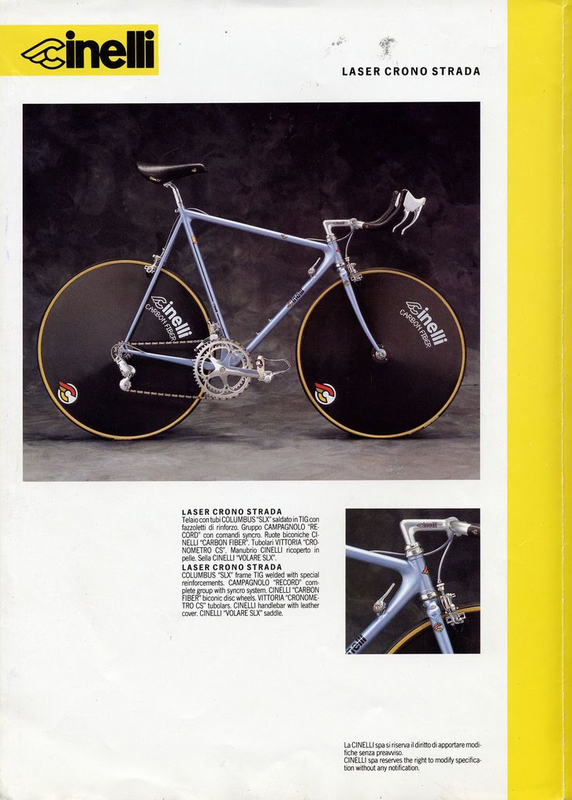 The Cinelli Laser that was model for my sculpting had been a milestone – and still is. A historical item. An object that is wrapped in a cloak of history, homage and respect. A mantel which is priceless. It is in this story the greater part of its value lies. It is also this mantle that forms the basis of the economic value it has today. The material, steel and carbon, does not have much value in itself. It is the idea behind the material that creates value. This bicycles sculptural aspects have since the early 80s, when engineers began experimenting with aerodynamics, had a major focus on the design of frames and wheels. The webbing of the frame for example was constructed so that the area around the angle joints had more of a streamlined form. In some areas drop shaped. The wheels were disc wheels, made out of carbon fiber. The aerodynamic frames and wheels was revolutionary and since then bicycles are not just seen as symbols of freedom, but also as objects with an appealing aesthetics, an aesthetic that did not exist before. However, at first it was not in the appearance that the focus laid, but in the aerodynamic benefits that these machines possessed. Many records were broken and the evolution of how a racing bicycle would look like had a furious pace. At the time, only the absolute world elite had access to these bikes and the hype around them, in combination with these internationally known names, was huge. In the 90s new rules on how a racing bike would be constructed, were introduced. The new regulations led to that many of the radical ideas and inventions, which were conducted in the 80s, were restrained and banned. In the 90s there was a lot of bad reputation circling the bicycle world due to doping. Also, among the common man during the 90s, mountain bikes and BMX bikes received a major boost and the revolutionary road bikes that had previously been constructed, were to some extent forgotten. In the beginning of the 21th century a wave of retro trends swept in, and along with it the old 80s bikes. The race bike had come to life again and people were digging out their old steel racers from the garage. Even the old race bikes with the revolutionary frame construction, had been given new attention and they were now up for sale on various online auctions. Because the bikes still had an extreme appearance in people's eyes, and with its high visual qualities, many of them are today used as decoration, leaning against a wall with a spotlight on. The practical quality of these sport machines became secondary. They are so hyped up (much because of their retro romanticism in combination with their history) that the price, sometimes, can be compared to the price of a luxury car. The focus has shifted from being focused on aerodynamics and practical function, to be about the visual quality. This is something I have noticed and I want to formulate a comment on that. Kerstin Gezelius writes about the hipster culture that exists today (Article, Hipstern hittar aldrig hem, part of a series, published in Dagens Nyheter, 2013-07-24). Her analyzes of the hipsters is that they sweep like a swarm of locusts, picks up old things, hypes it, and then leaving devastation behind, or anti-trends. A concept to tie the sculpture to is a vital part of the piece. This I realized even more as I studied discussion threads on various internet forums for bicycle enthusiasts. The Laser has a glowing gloria around it. It is praised to the skies. Sometimes it comes to a point that it becomes comical, and difficult to understand. It is just a bicycle. Or is it? I argue that it is more than a bicycle. It is a historical document. A groundbreaking historical treasure and it is its provenance that matters. The sculpture I was building had another. My concept is to shed light on the times we live in. A time where it is important to focus on the surface, without adding any more emphasis on content or quality. And so my work went on. The sculpture takes on the story of the model, and wraps itself in a new one. It is a new object that has a different idea. The visual quality, surface, forms the first impression. With my ideas and intentions, I wanted to take the viewer on to new lands and build another layer. Dig further, deeper. But how would this be achieved. My story began in the doing. In the creation. The desire for solving problems that arose along the way. This is for me one of the greatest qualities of this project. My desire that is nourished by a bottomless well of problems. I slid around in the workshop and without much knowledge of welding, brazing, sawing, making blueprints I found myself in a world of possibilities. The process was slow. And I let it. With great devotion and indescribable joy I shaped what eventually would become something that was all about surface. It is also about my observations on what it means. Are there different types of surfaces. What is the aim of surface. Is there a depth without a surface. Content and surface are quite close. Sometimes I find it hard to separate them and it is almost as if they merge together. A good content can make any worn surface shine. An interesting surface provides a pleasant light, and if you dig deeper you may discover that, precisely that is the content. Can a surface be content. Can content be created by something superficial. I get the feeling that one today cares less about the value of practical quality and about content. I feel that today there is a huge fixation on surface. That something can be bought for a cheap price, but of poor quality, is the recipe of the present. Making an effort for quality seems distant. In the capitalist society we live in today it has become increasingly important to have a physical product to sell and it is also important that it shows that you have bought something, even though it was perhaps a cheap thing. The Importance of valuing the practical quality has been somewhat overshadowed by visuals reflections. A society that puts more emphasis on the visual, do not put energy into practical quality. To illustrate this, my sculpture has all the visual benefits, but it lacks all the practical qualities that its surface gossip about. For a culture that only cares about the surface this would, in theory, not be something strange. How does it feel? It can be an interesting thought experiment, especially today when you can see in interior design magazines, how bikes are used as decoration. Homes built up with the basis that it must reflect a character, not a person (with content). A complete concept is conjured and one has not need to worry about filling it with something, because the surface already reflects it in this shiny package. The idea that the surface would be a reflection of the content; this is not the recipe of the present. Within the visual arts, one can ask where the values of practical qualities lies. Of course the visual quality has a value, but it is in the indication and designation the true value lies. If not, any copy would have the same value as an original. If an object's practical quality lies in the task of being visually affirming there is nothing to indicate that a copy would have less value than an original. The creation of the sculpture was meticulously documented. Between each image, there was a new problem to be solved. The documentation resulted in a blog (http://laserbuildingprocess.wordpress.com). A representation. Something that could represent my delight in the doing. A virtual sculpture. A story. A diary. Something that could be me. Something that could be the sculpture. This is where it would begin, the story. My thoughts combined with my dedicated building process would be the basis for it. A plunge into ideas of quality and value would take place and the surface would be forced. The surface was pierced and a vast meadow spread out. With flowers of all kinds. I published the blog on several bike forums online. Two Swedish, one London based and one Tokyo based. It then spread on its own, and has now been visited by bike enthusiasts from most part of the world. The sculpture has been subject of lively discussions. Although not all the posts has exclusively focused on the issues and themes I have been interested in, I find that all the various comments have contributed to the project and allowed it to grow, independent of me. […]No matter how good the [exercise] is, the result IS NOT the bike that you want to replace. That is the whole point, what tickles a serious cyclist or collector is to have the original, not a clone. […]I did learn my job from scratch, gone through many mistakes, and I have never been keen to show them around claiming was the result of "philosophical motivation or whatever", indeed I took all the mistakes under the magnifying lens to learn why the bad had happened and how to sort it and not repeating it. It is that simple. But this guy, what do you think he is learning by squeezing a rim in a vice? For heaven's sake, I do build wheels and such things do really upset me. […] If I had the money to build an expensive bike, would I also have the time to make a cheap clone with scrap and hang it on the wall? What for? With that time, I may do some extra hours at work and buy a new -real- bicycle. How better! He is making a clone, and does not give justice to the brand, nor makes it something worth displaying. Get those decals off and is all better. I am a huge Cinelli fan, in fact I do work hard to earn my money and BUY the real bicycles. That is the way to show appreciation, like you do for a band you like: go to their gigs and buy their cd's. And the whole execution may have been fun for him, but what does it learn to mess-up a frame in that way and squeezing a rim in a vice? Excuse me, I am a professional mechanic, my job is to build and repair cycles and make them work as good as possible. I've no time for foolishness and shoddy jobs, I've a week ahead fully booked with real jobs. It is that simple. […]he has an intention with the work and it demands the viewer to view it within the confines of the artists intention. The focus is not in the 100% authentic reproduction with regard to the techniques of constructing the original. He's looking to reproduce the iconic visual cues of the original. The reproduction he produced is merely a vehicle to a broader discussion. His copy, which at first glance, appears to be identical to the icon. Upon closer inspection... it's apparent it is definitely not. Witch then brings in to sharp focus, exactly what he goes on to explain via his blog on the about page (4th paragraph). And he's done a fine job of eliciting responses which are completely laid bare in this thread by many of the contributors. I would go as far to say some sound completely offended. I would not say this is completely in line with Warhol’s reproduction of 32 Campbell’s Soup Cans, but it's along the same vein: What is art? Where is the line between commercial goods and art? Can something commercially made be considered art? Warhol offended many through his work. The Laser is 3 dimensional but executed for the same effect. Icon chosen. Visual identity deconstructed. Elicit a response from the viewer. in theory, you're right. In practice, this has not much to do in a forum where some of the finest artisans write down, about things more down on earth. Alias ​​Gattonero comments show that there is hope. He/she demonstrates the devotion which I think is missing in modern pop culture. Gattonero do not care about my artistic intuitions (also, he/she does not realize that the object in question actually is an original in itself). He/she is a mechanic and believes that the greatest value of things is to be found in the technical quality. This is something that I have the greatest respect for and I am happy to hear it. Alias ​​Foryfour respond to Gattonero's comments by mentioning some of my concepts of the project and also mentions some historical references. Gattonero rejects and thus throwing me out head first, as he/she believes that this is a forum for cycling enthusiasts and craftsmanship. Everything has it place apparently. "The hypocrisy of copyright infringement in the artistic world"
"The desecration of form and beauty through imitation"
"The devaluation and dilution of an others dreams and aspiration"
[…]This is great, and in some ironic sense, makes your creation perhaps more 'fit-for-purpose' than an actual Cinelli Laser. […]You should feel free to move across all borders, as if a phantom which has abandoned the physical form. Nothing is sacred if you don't let it be. […] A 'Chinarello' is a brutally nasty phenomenon; a piggy-backing theft of not only an end product, but also an entire design process, where 'design' is defined as the vast and endlessly iterative process of creating something which is functional, safe, reliable, competitive, usable, manufacturable, and marketable with each of these elements being huge design undertakings in their own right. Creating a sculpture of the end result of a successful design process, as an artistic statement, is incomparable. Come on. He is doing this to take the piss out of all those poncy coffee shops, cafes, clothes shops, etc., which have a classic, iconic bike in the shop just because that is the fashionable thing to do. He is making an essentially unrideable copy of one of the classics to show how silly it is to use something which has gone through such extensive and thorough mechanical design as the Cinelli Laser as a decoration, and is saying, "hey pricks, if you are going to use it just because of its' appearance, and not how it performs, you may as well just have something which just looks like it, and nobody would be any the wiser." His sentiment is valid. It is also fairly amusing of him to post it on the Tokyo Cycling Club, as the Japanese are often some of the worst offenders of making and displaying bizarre approximations of western hedonistic iconography, without any real clue as to the history or true cultural meaning and significance of what they are aping. And he's done such a nice job that no-one is the wiser so doesn't that make the point moot? Unless you hang a sign on it telling people what your point is? But isn't that what he's doing here? Another excerpt. This is from an Australian forum. Alias ​​Chees analyzes the sculpture and raises the question of class distinctions. […]as a project it's pretty [badass] to deconstruct a Laser frame and build a replica even if it's 100% unsafe to ride ever. Similarly, I'm a fan of those [east] European dudes building McLaren replicas in their garage. I don't care about the rhetoric about 'commentary/analysis of hipster culture' or whatever. It's arguable that the phenomenon he describes, wherein people decorate with expensive objects, is just a means of expressing poverty. More broadly, people tend to spend their money on aspirational objects based on what kind of money they have. Poorer people buy clothes that look fancy or put chrome and 'rims' on used sedans, middle class people buy boats and McMansions and big TVs, rich people buy yachts and vacation homes. We buy the things that reflect the person we want to be, not fulfill actual needs. 'Decorating' with a Laser is the same as owning a classic car, but if you're 25 and kinda broke, you're not going to have a garage and you may not even own a car at all. A forum member from a US forum contributes with a complex issue that has been discussed before: What is art? I hope someday the art world will get over playing with people's emotions by producing crap and then calling it a success because people call it crap. I was in the San Fransisco MOMA with a batch of engineers. We were in the room showing the unjustly famous blank canvases when a tour guide came in and explained how important the blank canvases were to art history. We all left, because we were polite enough not to laugh at someone so earnest. Of course, in the next room over, some "artist" had created a health hazard by pouring molten lead all over the floor. The deeper meaning of that is problably ironic, "I created a superfund site and some idiot gave me a grant to do it"